E Media Architects » Blog Archive » We’ll Work for Free Contest on now! 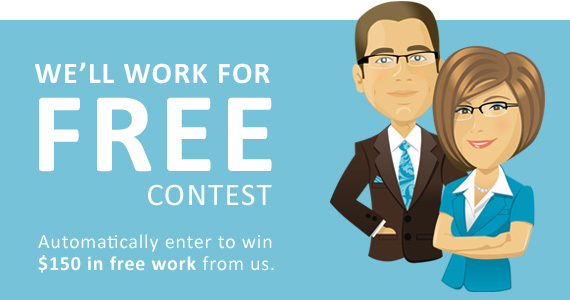 We’ll Work for Free Contest on now! Current clients: Our contest is on now! The more you spend, the more chances to win! For every $50.00* invoiced to your company from July 1 to August 2, you’ll automatically receive one entry into our draw. How easy is that? We’ll draw and announce the winner publicly on Twitter at twitter.com/emedia on Friday, August 5, 2011 at about 1PM Eastern. So get us working for you right away. Contact us now to discuss your project. P.S. Remember to review the mailpiece you recently received to learn about our current offerings. Contest rules: Contest is open to any client who has been with us longer than one year. Reward will be given as 3 hours of time credited to your account which you may redeem as consultation, design, or technical work, or any combination thereof. There is no cash value for this prize. The estimated value of this time credit cannot be redeemed towards hosting or domain renewal fees or other fixed or material costs, or toward outstanding accounts. *Before taxes.